MADRID (AFP) — Spain’s Javi Moreno (Movistar) won the individual time trial in the second part of a split opening stage at the Ruta del Sol on Wednesday. 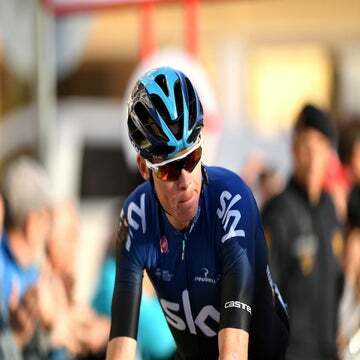 His fellow countryman, Alberto Contador (Tinkoff-Saxo) claimed an early eight-second advantage over Chris Froome (Team Sky) and the overall race lead. Moreno’s time of 9:51 over the 8.2-kilometer course through Coria del Rio edged out Wilco Kelderman (LottoNL-Jumbo) and Jerome Coppel (Cofidis) by two and four seconds respectively. Contador was six seconds back, in fourth, but that was enough to take the race leader’s red jersey with Froome finishing 10th in the time trial. The Briton is now fourth overall. With no bonus seconds on offer for stage winners, Contador will have the advantage as the two battle for overall victory across two mountaintop finishes on Friday and Saturday before a more sprinter-friendly final stage on Sunday. Neither Contador nor Froome were affected by a crash-ridden first stage of the day in which Dutchman Pim Ligthart (Lotto-Soudal) sprinted to victory ahead of Portugal’s Fabio Silvestre (Trek Factory Racing) and Slovenian Grega Bole (CCC-Sprandi-Polkowice). The Lotto-Soudal rider won the 118.3-kilometer ride from La Rabida to Hinojos in Andalusia by two seconds after a crash three kilometers from the finish split the peloton in two. Thursday’s 191.7km second stage, the longest of the five-day race in Andalusia, takes the riders from Utrera to Lucena.